Exporting search results to Excel allows you to easily create lists of items that you may need for your work. A sales person searches for his last quarter won deals, exports the results, copies the customer name and amount columns, and then pastes the information in a report. An engineer searches for internal documents that are most relevant to a specific topic, exports the results, and then in Excel sorts rows by authors to see which names come more often to help him identify potential subject matter experts within his company. A support agent searches for all cases opened by employees of one company during the past year, exports the results, copies the case title, date, requester, and resolution time columns, and pastes them in a table in an email to his boss who requested this information. Using keywords and facets, leverage the search interface to create a list by gathering the documents from which you want to extract information. 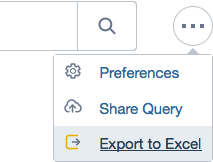 On the right of the search box, click the Settings button, and then select Export to Excel. Your browser manages the Excel file download. Each row corresponds to one search result and each column contains the value of on field for each result. Note: By default, the exported Excel file contains a maximum of 100 search results sorted by Relevance. Your search interface administrator may however customize the maximum number. Locate the column(s) containing the information of interest, and do whatever you want with the information, such as copying and pasting the information into another document.